The Design Museum's new home inside the former Commonwealth Institute in London is an oak-heavy, hotel-like interior that is impressive, but could have been so much more exhilarating, according to critics. 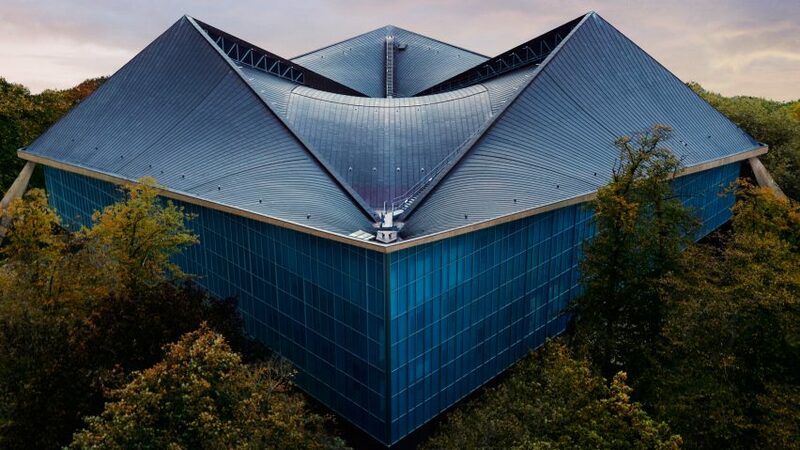 London's relocated Design Museum opened its doors to the public for the first time yesterday, although the press were invited in for a tour earlier this month. Observer critic Rowan Moore said it was "an exceptional achievement" that an attraction that first opened in the basement of the V&A now has its own £83 million premises. But he suggested that the project might have been much more impressive if John Pawson, who designed the interiors, and OMA, which masterplanned the site and designed the neighbouring apartments that funded the project, had switched roles. "This achievement would have been greater if OMA had designed the museum and Pawson had designed the luxury apartments," he said. "For both seem to be playing out of position, trying to work with situations with which they don't feel entirely comfortable." Moore claimed the site "could have been a truly exhilarating place if it showed more interest in its content and surroundings", but that instead the converted 1960s building is "a clumsy dance partner for the OMA blocks". Guardian critic Oliver Wainwright said the space felt more like a luxury shop or hotel than a major museum. "The aerial drama feels a bit suffocated by the boxy levels of oak veneer stacked up below, as if a mid-range business hotel had been shoehorned in beneath the great concrete kite," he wrote. "Some of the spaces seem a bit squeezed in around the building's difficult structure, and there are odd moments of feeling like you’re in a building-within-a-building." Despite this, he praised museum director Deyan Sudjic for the achievement, given the financial model – created through a deal with Chelsfield, the property developer that owns the site. "It might not have been the most imaginative choice of architect, and there are compromises in the nature of the partnership, but, given the circumstances, Sudjic has pulled off an impressive deal," said Wainwright. Similarly, Financial Times architecture critic Edwin Heathcote described the project as the product of an era of consumerism. "The residential blocks outside reinforce this image of architecture's pivot from radical public vision to private trophy," he wrote. But Icon deputy editor John Jervis was far more critical, calling the new museum a "a sharp reminder that the narcissism of starchitects and the expansionism of design advocates remain essentially powerless against the political and economic forces now shaping our cities". He claimed that the building was "far richer and more revelatory" before the renovation, and that Pawson's insertions create "an overbearing bulk that both contradicts and conceals much of the roof’s famed curves". "This is not how museums should be made, nor how buildings preserved," he concluded. The Design Museum was first established by designer Terence Conran and journalist Stephen Bayley to highlight the importance of industrial design to contemporary culture. Originally housed in the basement of the V&A, the museum moved into a converted banana warehouse at Shad Thames in 1989. But when Deyan Sujic took over as director in 2006, he started planning the museum's relocation. Pawson's conversion of the former Commonwealth Institute provides the museum with almost 10,000 square metres of exhibition space – triple the amount at its previous location. The project was made possible through a deal with Chelsfield and the local council – the property developer was given permission to fill the site with luxury flats, in exchange for £20 million towards the renovation, and a rent-free 300-year lease.